We’re excited to announce our expansion in working with a second orphanage in the outskirts of Kenya called Sons of Manase Children’s home. After some hardship earlier this year, Beatrice, the Director of the children’s home, lost her husband, Joseph, and found herself completely alone. She prayed for some guidance on how she could continue the education for these students. She needed hope and an idea came to light. Beatrice never had time to mourn her late husband, she was left with a big weight on her shoulders supporting all these children in addition to finding revenue to maintain the operation. In her dire situation, she decided she would send donation requests to anyone who cared to listen. Moja Tu was fast in listening to her plea on behalf of the children and responded with full sponsorship for the two kids facing the biggest challenge of discontinuing their education. Beatrice is now full of joy and cannot hide her smile when the name Moja Tu is mentioned. To her this is a name that means she can proceed with the good work that her late husband along with her had started back in 2006, when the pangs of HIV/ AIDS were prevalent in her neighborhood a situation that lead to them taking in the first 2 children who had been left orphaned. 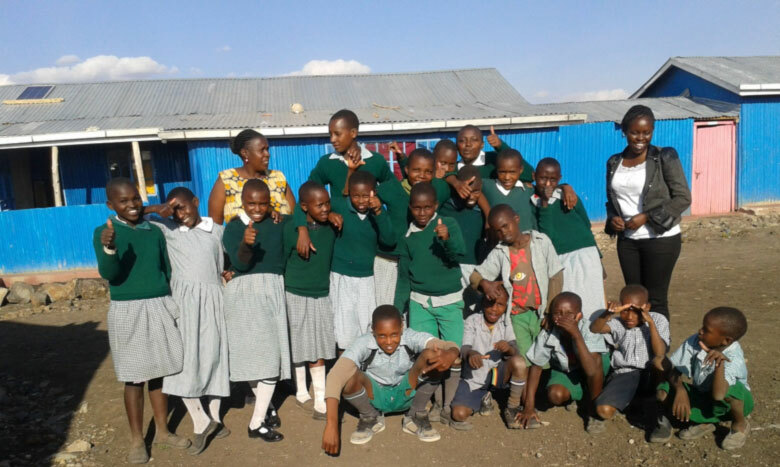 This had sparked their passion to take care of more children alongside their own and they kept receiving more and more children into their house and this led to the current day Sons of Manase Children’s home. It is in this home that 39 children including 4 children of her own now live. In their 1 acre of land, they have put up semi-permanent structures to host all the primary school going children who go to a nearby public primary school, 3 kilometers from the home. However, there weren’t the funds available to pay for the boarding secondary school students, which is not provided by the Kenyan Government. She had already prepared 2 children to be ready to repeat the 8th grade after their National Examination this year (2014) since she could not find the funding to pay for their education. She says “Billy and Tracy were ready to repeat class 8 to give me some time to raise enough money for their secondary school education, until I received a call from Moja Tu, an organization I had written two months ago would send someone to visit our Centre. I got a good feeling about that and here we are, both children are already sponsored by Moja Tu.” She appreciates the support given by Moja Tu sponsoring the children in grade 8 and happy that she does not need to turn away any of the children under her care. All she needs is to do now is ensure that these children give 100% on their national exams and get acceptance letters to secondary school.